High density developments are becoming the wave of the future. 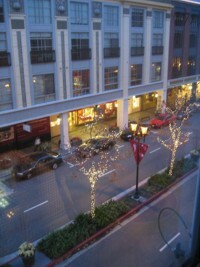 Perhaps the most prominent "high density" development in the Bay Area is Santana Row with trendy shops & exclusive restaurants, and contemporary residential lofts tantalizing the progressive bay area resident to be a part of this movement. This has become desirable for many bay area residents that want to have entertainment, shopping and a social outlet waiting just outside their front door. Many downtown businesses sense the high demand of residential-retail zoning, which is alluring many business districts to take advantage of this commercial high density epidemic. The public concern for high density zoning is that it will bring unmanageable traffic and cars and high taxes and noise to the community. On the flip side, some residents have voiced excitement and acceptance that it will bring money to the city, restaurants and better quality entertainment. Moreover, it will lead to higher economic activity and productivity, save tax dollars, and increase property value. As worrisome or exciting as it may be to the community, there is hardly an area untouched by this new wave of high density development; San Jose, Santa Clara, Sunnyvale, Palo Alto, Campbell, Los Gatos and even Willow Glen are all conforming to this new way of life. An example of high density development that has majority of public acceptance is Sunnyvale Town Center's new urban development project. It has been underway for some time but the ultimate outcome will be 991,000 square feet of retail space, 315,000 square feet of office space and 292 ownership housing units. There will be a 14-screen movie theater and a 200 room hotel located at Murphy and McKinley Avenues. The 184-acres project encompasses a large block bounded by Mathilda, Washington, Sunnyvale and Iowa Avenues, known as the Town Center Mall. The shops are planned to start opening in early 2009. The vision of this new development is for a lively people-friendly place for shopping, working, living and entertainment. Sunnyvale residents are actually quite pleased with the new development, as it will bring in revenue for the city, increase visibility to the area, bring in restaurants, and retail and ultimately boost their home values. Some residents of other neighborhoods are not quite as pleased. I have heard public outcries from the Willow Glen Neighborhood Association (WGNA) when they recently heard the news of the latest high-density development proposal. The plan is to create a Community Benefit Improvement District (CBID), with "?mixed-used' buildings along Lincoln Avenue with housing above retail; the project is said to attract better businesses on the avenue, and promote affordable housing. There has not been a very positive reception to the idea that the "?beloved' Lincoln Avenue will potentially lose the charm and character that it has preserved over the years. The majority of the public is outraged that big developers will come in and modify the old-fashioned downtown area and bring in retail chains and large department stores and push out the "?mom and pop' businesses, thus destroying the neighborhood. Another obvious concern of is the excess of cars and traffic that will result. Lincoln Avenue is the centerpiece for a lot of residents in Willow Glen and to lose the small downtown feel would be tragic for some. When comparing other high-density developments, the one key element that say Santana Row, Sunnyvale, Campbell and downtown San Jose have is several blocks to develop; Lincoln Avenue is only one long street with single family houses surrounding. It will be interesting to see what the final outcome will be when business property owners in Willow Glen vote this month for the CBID initiative. If you have a stance about this new high-density trend in your neighborhood, let your community know how you feel by participating in your local neighborhood association. Feel empowered to take part in your community and get involved. High-density building is part of the future; to better embrace this new wave of development, there is a lot of research available online to better educate yourself with this up-and-coming boom. For the past several years, there has been a great deal of rezoning of property from commercial to residential in the 94089 zip code of North Sunnyvale. Within this particular plot of land bordered by Tasman Drive on the North, Morse Avenue and Fair Oaks Avenue on the West and East, and Weddell Drive running along the South end, there's been a great land grab by various developers. With the exception of the building pictured here, located on Fair Oaks currently leased to Paramount Tumbling and Gymnastics, various new developments have sprung up throughout the area such as City Park and Verona by luxury builder Toll Brothers, Parkside Villas, Tasman, and Crossman Place built by popular local builders Barry Swenson and Palo Alto based Classic Communities. One of the very first developers to stake claim to North Sunnyvale is also one of the nation's largest builders, Pulte Homes, who built their first development Danbury Place of 168 homes in 2004. Since then, Pulte Homes has been actively buying more land within this small one block radius and since their 2004 debut, has built 30 homes in Danbury III in 2006, 43 homes in Danbury IV in 2007, and 36 homes in Danbury II in 2008 for a total of 277 homes. There has been previous negotiations with the owner of the Paramount Tumbler and Gymnastics building that had not resulted in the sale of the property in past. It sounds like now, the "last man standing" is interested in re-opening talks with various builders including Pulte Homes. Could we see a Danbury Place V on the horizon? Pricing for Danbury I homes in 2004 ranged from $590,000 - $630,000. Today, Danbury Place has only 10 homes (including model homes) remaining scheduled to all be complete by August 2008. Prices ranging from $728,900 - $834,900. We keep our ears close to the ground for the latest real estate news to ensure our clients have the best representation. After all, new home construction affects the entire real estate market for both buyers and sellers. From our Geography lessons and possibly from our travels, we know that Bordeaux is a very well toured port city in the southwest of France with over 1 Million Bordelais inhabitants and is proud to be known as the world's wine industry capital. It is a diverse city with makeup of all different races and cultures of people and over the last decade has become an urban metropolis. If you live here in the Bay Area you don't have to travel to France to visit the newest community named Bordeaux; it is located in the heart of Santa Clara County , in the urban setting of Sunnyvale. Like Bordeaux France, Sunnyvale is known to be a diverse and culturally varied city with neighboring industry and a rich past of agricultural history. Perhaps this is how the name of the newest KB Homes community was formed, because of this vague likeness shared with the city of the same name. Like Bordeaux France and its rich grape vineyards and wine production, Sunnyvale has been known for its fruit orchards and has had a vital economy of agricultural richness, and for centuries has maintained a reputation for fruit production. In the mid 1900s a lot of the fruit orchards in Sunnyvale were cleared to make way for new homes and industry in this wonderfully temperate city; new developments began popping up everywhere in the 1950s. Just this past year, KB's Bordeaux development broke ground and the first phase of homes are now ready for occupancy. 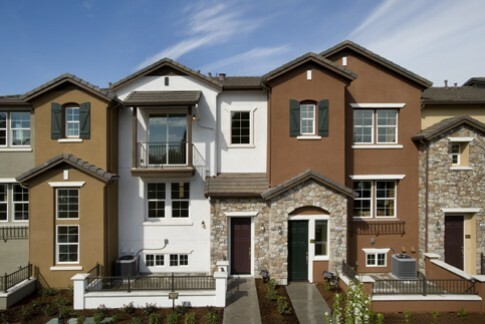 The Bordeaux community is located near Reed Avenue and Lawrence Expressway, on Aster Avenue in Sunnyvale . This area has been rezoned in the past years to Industrial-to-Residential/Planned Development. Before construction started, this land was home to a many industrial companies that have recently picked up and moved. The remaining close-by companies include a few other industrial businesses as well as a development of other new homes down the street. It is an up-and-coming neighborhood has become a very sought after part of Sunnyvale . The stats on this new 80-home development include 6 unique floor plans, with prices starting around $565,000. KB Homes catch phrase is known as "?built to order' which means that you find the location of your KB home, and essentially customize it to your personal taste and style. There are many design features and upgrades available and your new home can be built to your own specifications, and is ready and operational on the day that you move in. Bordeaux's Grand Opening took place on March 15th and the response has been pretty positive. So far, 5% of the homes are under contract with another 10% reserved. The types of people interested in this community are 1st time home buyers, people upgrading from small condos, with the majority of these people being young urban professionals. The most sought after floor plans are Plan 5 (2 bdrm/2 bth, 1238 square feet) and Plan 9 (3 bdrm/2.5 bth, 1924 square feet). The least requested floor plan is the Plan 4, which is the smallest unit in the development, featuring only 1056 square feet of living space and a 2-car tandem garage. Sunnyvale is home to a lot of shops and restaurants and in my opinion has one of the best Farmer's Market in the Bay Area. In addition, the major employers include Juniper Networks, Palm, AMD, Yahoo and Maxim. There is a lot of character to Sunnyvale and if you find yourself driving around town you can see the old modern Eichler homes, a cute downtown with bars, shops and restaurants, the community center which is a wonderful place to bring a good book and people watch, and then there's Baylands Park which offers recreational pathways and picnic grounds. There are golf parks and tennis centers "? it is a community filled with activities and lots of things to do. If you are interested in this new development and would like to be represented by an area specialist of this community, please contact me. In addition to helping buyers and sellers everyday with resale properties, I enjoy taking clients on tour to the new developments as well. I cooperate with many local developers in the area, and have experience in the new home buying process. I help to negotiate in the best interest of my client, and to make the home buying process as smooth and effortless as possible. For families interested in Sunnyvale schools, the numbers are 900 and 901. Those were the API scores for Sunnyvale's Cherry Chase Elementary and Cumberland Elementary, the highest-rated schools in the Sunnyvale Elementary School District according to 2007's API growth report. Cumberland joined Silicon Valley's elite schools with 900 or above API scores this year with its 36 point increase. As you might expect, homes in Sunnyvale that feed into Cumberland and Cherry Chase are more expensive than those that feed into Sunnyvale schools with lower test scores. As you can see from the benchmark homes, Cherry Chase Elementary and its reputation have been built into real estate values. Cumberland Elementary doesn't have that same premium because it has been on the rise, from 845 in 2003. Another steadily improving school is Ellis Elementary, up from its 773 in 2005 (though slightly below last year's 822). It could represent a good deal for young families who plan to upgrade after elementary or middle school. And people not wanting to pay a premium for schools might consider the other representative homes. But Sunnyvale Elementary isn't the only elementary school district in Sunnyvale. 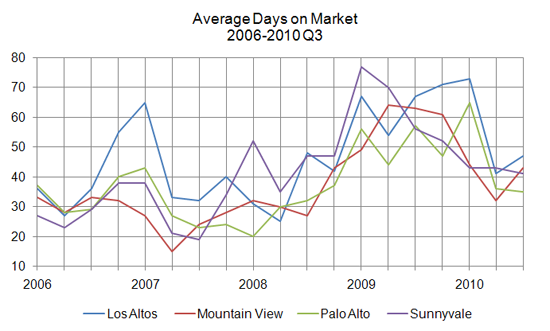 Because of the complexity in the way school district border lines are drawn, students in a large part of Sunnyvale actually attend schools in the Cupertino Union School District. How much opportunity is there in the overlap? These homes are slightly newer than the ones in the first table and are comparables close enough for a rough comparison by square foot price. Nightingale, with Santa Clara Unified's Laurelwood Elementary as its representative school, comes in at an 18% lower per square foot price than the home on Fern Ridge, in the elite Cupertino Union School District. Test scores aren't the full picture of any school, but if the API number is important in your search, this difference is something to consider. Very near the border of Cupertino and Sunnyvale is Duncardine, which feeds into Stocklmeir Elementary. Stocklmeir's test scores are the highest of any elementary school Sunnyvale residents can currently attend, and this particular home is less expensive ($62,000 by absolute measurement and 10% per square foot) than Cherry Chase's Lynn in the first table --- even though it also has an arguably better middle school. While the simple comparisons here based mostly on elementary schools and not other tangible or intangible factors that may give value to a home, being able to break out one axis of measurement is often helpful to my clients, especially given so many factors to consider when buying a home.